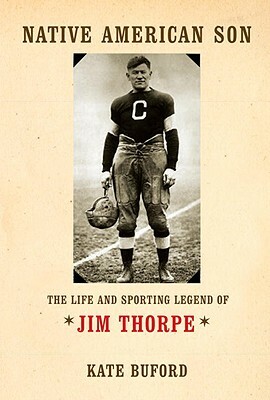 The first comprehensive biography of the legendary figure who defined excellence in American sports: Jim Thorpe, arguably the greatest all-around athlete the United States has ever seen. With clarity and a fine eye for detail, Kate Buford traces the pivotal moments of Thorpe’s incomparable career: growing up in the tumultuous Indian Territory of Oklahoma; leading the Carlisle Indian Industrial School football team, coached by the renowned “Pop” Warner, to victories against the country’s finest college teams; winning gold medals in the 1912 Olympics pentathlon and decathlon; defining the burgeoning sport of professional football and helping to create what would become the National Football League; and playing long, often successful—and previously unexamined—years in professional baseball. But, at the same time, Buford vividly depicts the difficulties Thorpe faced as a Native American—and a Native American celebrity at that—early in the twentieth century. We also see the infamous loss of his Olympic medals, stripped from him because he had previously played professional baseball, an event that would haunt Thorpe for the rest of his life. We see his struggles with alcoholism and personal misfortune, losing his first child and moving from one failed marriage to the next, coming to distrust many of the hands extended to him. Finally, we learn the details of his vigorous advocacy for Native American rights while he chased a Hollywood career, and the truth behind the supposed reinstatement of his Olympic record in 1982. Here is the story—long overdue and brilliantly told—of a complex, iconoclastic, profoundly talented man whose life encompassed both tragic limitations and truly extraordinary achievements. Kate Buford has written for" The New York Times, Architectural Digest, Film Comment, " and "Bluegrass Unlimited, " among other publications. She has been a commentator on NPR's "Morning Edition" and American Public Media's "Marketplace, "and on Virginia's NPR affiliate, WMRA. Her biography of Burt Lancaster was named one of the best books of 2000 by "The New York Times, "the" Los Angeles Times, "and "The Washington Post." She lives in Lexington, Virginia, and Westchester County, New York.